Mr. Aston was born in 1993 and has been acting since the age of 5. He's been featured in a Warburton's Bread tv commercial as well as episodes in Where the Heart Is and The Bill. He's had no formal training but has attended a weekly acting workshop for some time. He's the youngest of nine siblings and still lives at home in Bacup. 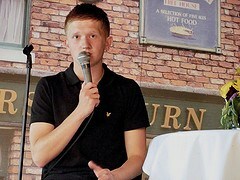 Chesney Brown arrived on the Street in 2003, Cilla Brown's son and Fiz Brown's little brother. He had been in and out of care much of his childhood due to Cilla being a rather neglectful parent. Cilla's new boyfriend, Les Battersby agreed to take the lad in along with Cilla and grew close to the boy in spite of being a less than stellar parent, himself. He even agreed to adopt Chesney though left Weatherfield not long after. Cilla, too, left Weatherfield for a new life in Las Vegas, leaving Chesney in Fiz's care with help from her then-boyfriend Kirk Sutherland. Chesney's first girlfriend was Kayleigh Morton but that ended when her family moved away. Chesney's best mate is his dog, a great dane called Schmeichel. The puppy was given to him by Tyrone and was nearly sold by Cilla but was returned to the lad and is now firmly in residence. (Canadian Spoiler warning!) Chesney has currently left school and is selling dog collars and accessories on the local market and he hates Fiz's new husband, John Stape. Sam loves to play golf and football and loves watching films. His favourite actor is Denzel Washington. He loves being on Corrie because there are so many great people he works with and he loves being able to do something he really enjoys. He is looking forward to getting more adult type storylines now he's a bit older. Sam told us he was really enjoying Nova Scotia and plans to return to visit again.